Discussion in 'Released' started by fencedin, May 17, 2016. This is a mod that changes the way you play terraria that was inspired by minecraft skyblock style maps. You will start on a very small island and must learn to gather and craft blocks in new ways. The extractinator in an even more useful machine now, along with a few more machines to help you complete your Terraria playthrough. There is also lots of new crafting recipes for the items you would normally get in a playthrough. Also, you will also want to make sure you take advantage of duplicating liquids, as Obsidian (which can be broken with a copper pickaxe) is a major part of the mod and you have limited quantities of both water and lava. Used just like you would normally use silt on the Extractinator. jopojelly, GabeHasWon, bluemagic123, JABofNeurospine, pie75, MaxAstro, and the tModLoader discord community - Thanks for all the support with my coding endeavours! Thanks to all of you for over 20,000 downloads! DankySkeleton, DoktorDare, DraLUSAD and 11 others like this. This looks really neat. I assume you start on an island, is there an image of the island you can post? I need to use this mod someday... Not today, gonna do a bunch of mods together today. But someday, I will. Probably. Heh, you're welcome. When it gets far enough, I could see you making the "Skyworld" a preset for the world. 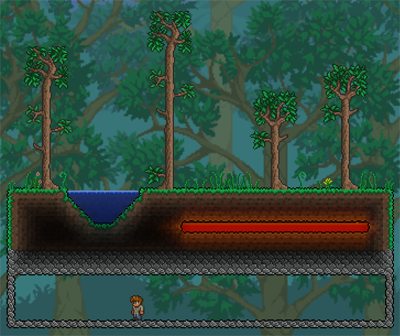 This is a mod that changes the way you play terraria that was inspired by minecraft skyblock style maps. You will start on a very small island and must learn to gather and craft blocks in new ways. The extractinator in an even more useful machine now, along with a few more machines to help you complete your Terraria playthrough. Would it be okay if I remake the sprites so that they look better? Added a pic of the island you start on in the post. If you are talking about the machines, have you seen them in game? I went back and forth with the 2x2 pixels and 1x1 pixels, I know they look odd but they look decent in game, the screenshots don't do them justice, maybe I will upload gifs instead of the stills. This mod looks really cool! I'll try it out and download the map! I've never felt the urge to cheat more than I have the last few hours playing this mod/map. I just need some copper!! Where are you! i got plenty of copper atm, im more at a loss when it comes to the automation... also multiplying lava is a pain.. is there a setup any of you would recommend? Edit: Also at a loss when it comes to cobweb... but i havent extractinated everything yet..
you can craft an extractinator with gray bricks and a forge. That mod looks really good! I really like the Skyblock idea and how you made it possible with added items. Oh and I should add, that I also like your 1x1 Sprites! They look exactly how they should and I dont think they could look as good in 2x2. I like to weight the amount of time you would have to go out in the world and hope that RNG was on your side to find certain things to the amount of time it takes to duplicate lava over and over again. The multi-tile machine will automatically harvest obsidian (and it will get you more than 1 per operation some of the time so you don't need as much liquid) but you will have to defeat some bosses first. You should hit something to the east easily, to the west might be a little harder to find. And, I still wish you would make a recipe viewer only version of Cheat Sheet so people could have recipes for mods and not be tempted to cheat and spawn in things. Though it still wouldn't show 'recipes' for things like the extractinator. Thanks! I absolutely love skyblock in minecraft and I wished it was possible in Terraria. I tried to add as little as possible and as few recipes as I needed. And, I think the animation helps draw your attention away from the 1x1. I didn't want to make them larger but I still wanted the detail. I may still tweak them a little bit. I was going to code something like this, but I never got around to it. Hope this turns out well. Okay so i play for about 10 or twenty minutes and now I'm stuck, i cut all my trees and I have two fertilizer, 80 wood, and the things I started with, how am I supposed to get copper and iron and tungsten and all that? ?